The kids from Hasek's Heroes went behind the scenes at the KeyBank Center Saturday prior to the NCAA National Championship hockey game. 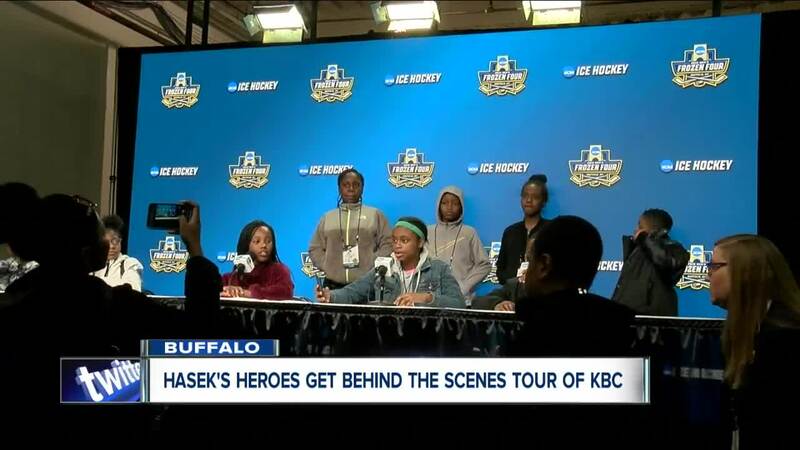 BUFFALO, N.Y. (WKBW) — The kids from Hasek's Heroes went behind the scenes at the KeyBank Center Saturday prior to the NCAA National Championship hockey game. Participants received a tour of the media interview room, team locker rooms, team benches and other areas the public rarely gets to visit. They also were able to get a picture with the NCAA National Championship hockey trophy. Hasek's Heroes, which was created by Buffalo Sabres legend Dominik Hasek, was selected by AT&T and the NCAA for this opportunity due to its advancement of hockey in the community. Since 2001, Hasek's Heroes has provided programs for development within a hockey-centered program for in-need children across Western New York. The programs which are built on the foundations of athletics, academics and character development, also provide on-ice and off-ice team building and leadership skills. You can find more information on Hasek's Heroes here .